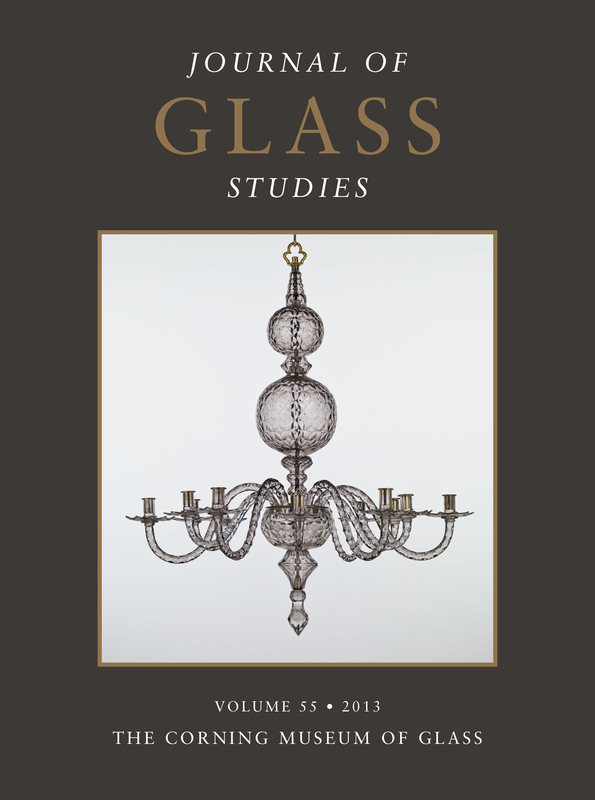 A total of 12 articles are presented in the 2013 volume of the Journal of Glass Studies. They include a rare Egyptian blue glass face inlay of King Akhenaten; a colorless glass kotyle and a faience pyxis excavated from a tomb in Thessaloniki, Greece; yellow sectilia in the Gorga Collection, Rome; a glass drinking horn in the Royal Museums of Art and History, Brussels; late 7th-century glassmaking at Glastonbury Abbey; a basin attributed to George Ravenscroft; Jean-Pierre Colné and the French-American origins of mechanized glass cutting (1850–1880); and John Talman’s “Drawings from Painted Glass in Norfolk.” Several notes include topics on a Hellenistic, core-formed glass alabastra from Greece; a mold-blown jar with oriental-inspired decoration that was found in Lyon, France; and an investigation of the dedicatee and redating of a pilgrim flask in The Corning Museum of Glass. This volume is dedicated to the memory of David B. Whitehouse (1941–2013), former executive director of The Corning Museum of Glass (1999–2011) and a noted scholar of ancient and Islamic glass. Glass was a royal monopoly and highly-prized in ancient Egypt, but surviving examples of royal subjects are rare. One of these is an inlay of the face of King Akhenaten that is part of a composite figure, but no other pieces of that figure are known to have survived. This object is discussed in terms of the type of headdress that the king wore, the scene of which the complete figure may have been a part, reasons for and the meaning of the coloration, and the inlay’s possible relationship to a similar turquoise glass face inlay probably depicting Queen Nefertiti. Both were in the Christie’s auction of the Groppi Collection on April 26, 2012. The king’s face was acquired by The Corning Museum of Glass (2012.1.2). In Thessaloniki, Greece, a tomb excavated in the West Cemetery of the ancient city revealed the burial of a woman with rich grave goods, including a colorless glass kotyle and a faience pyxis. The kotyle, decorated with white lotus petals that are pointed and fluted, stands on an echinus-type base and has two horizontal handles. The faience pyxis has pale turquoise glaze, with details in yellow, off-white, and dark purple (?). The body has egg-and-dart decoration with applied gold-foil petals, guilloche with gold bosses, and a yellow and turquoise wave pattern. The burial took place about the beginning of the third century B.C. The two vessels, dated to the third quarter of the fourth century B.C., were interred after prolonged, probably ritual, use. The pyxis shares stylistic and technical details with a faience kalathos unearthed in a contemporaneous burial in Thessaloniki. The latter was recently redated to the fourth century B.C., and both vessels are attributed to the same workshop. Glass sectilia that were part of the decoration of the imperial villa of Lucius Verus (r. A.D. 161–169) in Rome and are now in the Gorga Collection are an important source of information for understanding Roman glassmaking techniques. Small fragments of 10 sectilia, selected from more than 1,000 monochrome yellow pieces in the collection, were analyzed to determine their chemical composition and to identify the yellow pigments (chemical composition and crystallographic nature). Roman artisans obtained different yellow hues with three different pigments (lead antimonate, lead stannate, and lead-tin antimonate), used either alone or in combination. The yellow pigments were prepared by roasting mixtures of lead, tin, and antimony compounds. Iron was sometimes added during the production of the pigments to increase the number of available hues. The hypothesis of an alternative use of tin-based and antimony-based yellow pigments in ancient Roman glass must be reconsidered. Consequently, tin-based and antimony-based yellow pigments cannot be construed as a fingerprint for a specific period or a specific location of the manufacture of yellow glass. A fortunate set of circumstances led to the acquisition in 2010 of a complete drinking horn from the Merovingian period by the Royal Museums of Art and History in Brussels (inv. no. B005829-001). The horn, which is very large and has a simple shape, was discovered during old excavations, and it may have come from the cemetery of the Brussels borough of Anderlecht. It is translucent olive-yellow, heightened by bluish green latticework and three arches of the same color. The horn is typologically related to Lombardic drinking horns with latticework, but there are some distinct differences. Nevertheless, the vessel may have been produced locally. The authors date the object to the sixth or early seventh century. Chemical analysis of the bluish green glass identified a natron soda-lime composition, which confirms that the horn was produced in antiquity. Excavations at Glastonbury Abbey, undertaken between 1951 and 1964, revealed the most extensive remains of early medieval glassmaking found in Britain. However, the complete excavation archive and finds have only recently become available for study. Re-evaluation of these records suggests that the remains of five different furnaces were located, and radiocarbon dating demonstrates that they were in operation during the late seventh century A.D. Compositional analysis of the glass that was worked there has confirmed that it was largely imported from eastern Mediterranean sources, rather than being scavenged Roman cullet, and there are indications that the glassmakers may have come from Gaul. Consequently, many parallels can be drawn between the glassmaking at Glastonbury and that at other early monastic sites in Britain, and the pivotal role played by the church in the reintroduction of glassmaking to Britain is further emphasized. In March 1265 C.E., the Mamluk sultan Baybars laid siege to the town of Arsur in the central coastal plain of Israel and, after 40 days of fierce fighting, took it by storm. The entire site of Arsur was razed, and it has been left in ruins ever since. Among the excavated features of the castle, a cesspit used for refuse by the besieged Hospitaller knights and defenders was unearthed, yielding large numbers of local and imported pottery vessels, metal and stone artifacts, and especially undecorated and luxury glass vessels. The importance of this assemblage lies in its terminus ante quem of late April 1265, and the relative scarceness of well-dated everyday artifacts of this period. The size, diversity, and secure archaeological context of this glass assemblage make it an important study case for Crusader glass research in Israel and beyond. In October 2008, The Corning Museum of Glass acquired, at auction in London, what was described as “an Indian (Mughal) Spittoon.” However, David Whitehouse, who was then executive director of the Museum, had noticed that the object bears the seal of the English glassmaker George Ravenscroft. Ravenscroft used such a seal between 1676 and 1679 to assure customers that he had overcome the problem of crizzling, a feature of his earliest production of lead (crystal) glass. The object was initially described as a spittoon because it is of the same form as the spittoons known in the Chinese and Mughal cultures. However, these spittoons have a diameter of about 12 centimeters, whereas the object discussed in this article is about 26 centimeters in diameter. It is now identified as the basin from a ewer-and-basin set (the ewer sitting on the basin), used in the ceremonial washing of hands before eating. It seems likely that this object was made by Ravenscroft for export by the East India Company to India. Hookah bases are known to have been exported in the same way. This article presents an in-depth analysis of the drawings of stained glass windows from Norfolk churches gathered in an album acquired in 1967 by the Rakow Research Library of The Corning Museum of Glass. These highly finished drawings were made between 1705 and 1709 by John Talman, a keen antiquarian and a founding member of the Society of Antiquaries of London. The importance of the drawings cannot be overstated, since they document works now lost at Boyton, Ely Place, London, Ranworth, Upton, and Woodbastwick, and contribute to identifying the provenance of glass installed in the east window of Norwich Cathedral. Moreover, they provide remarkable evidence of the working methods of antiquaries at the beginning of the 18th century. Excavations at the Cistercian nunnery of Clairefontaine, located near Arlon in the south of Belgium, revealed an assemblage of 18th-century colorless glass. The morphology of the vessels and the engraved decoration suggest a central European origin or, at least, stylistic inspiration. The composition of the glass points to a recipe combining silica, lime, and potash: a colorless potash glass à la façon de Bohème. This article considers the technology, morphology, and origin of the vessels. The art-historical analysis is supported by chemical research (scanning electron microscopy–energy-dispersive X-ray spectroscopy [SEM-EDX]). The finds are also discussed in light of the emerging northwestern European glass industry, changing consumer practices during the 18th century, and their meaning for the inhabitants of the abbey. This article, which covers the period 1767–1789, deals with reports from the Venetian “resident” (the equivalent of ambassador) in London. The reports deal with several topics, including (1) the poorly controlled importation to England of Venetian beads (some arrived legally, and some were smuggled) and their export from London, Liverpool, and Bristol to Africa, the Indies, and elsewhere; (2) competition between the bead industries in Venice and Bohemia (and the Netherlands), which led to a Venetian investigation into the composition of Bohemian beads; (3) preoccupation in England with the Revolutionary War to the detriment of reports on the bead trade; and (4) initial moves in the House of Commons toward abolishing the slave trade. The “resident” also attempted to persuade the Muranese glassworkers to reproduce the carnelian gemstone beads that were being exported from India. The scale of the Venetian glass industry at that time is surprising. In 1767, there were 2,000 glassworkers on Murano and 4,000 mirrormakers, 800 margariteri, and 4,000 perleri in the city of Venice—about 11,000 workers employed in glassmaking of one sort or another. Jean-Pierre Colné, formerly of Baccarat, arrived in New York City in 1848. He received a United States patent, Machinery for Cutting Glass, in 1851. Until 1855, his machinery was used at the New York factory of Joseph Stouvenel and Company to cut blanks made by the Brooklyn Flint Glass Company. After failing to establish a factory in La Salle, Illinois, Colné returned to his inventions in the 1870s. He presented a display at Philadelphia’s Centennial Exhibition in 1876 and at Paris’s Exposition Universelle in 1878. His Paris display was a frequent topic in the official report on glass at the exposition, written by his son Charles. In 1880, Colné’s machinery was licensed to Val St. Lambert of Belgium, where it was used for over 12 years. This article includes illustrations of glass cut by the machinery and an explanation of how the machinery was used to cut a wide variety of forms and patterns. The Vase aux lys tigrés, made at the Daum factory and housed in the Fine Arts Museum in Nancy, is a remarkable piece. Although it is an Art Nouveau design, befitting the factory’s glory days from 1897 to 1914, it was not made until 1927, almost 20 years after the supposed end of the movement. This type of piece is unusual but not unknown for Daum or for many other manufacturers of the time. It demonstrates the economic importance of this production and the complexity of the arts industry, which attempted to strike a balance between the expectations of consumers, aesthetic demands, and the industry’s own restrictions. The vase also shows what appealed to the public, whose tastes were less definitive and categorical than those of art critics. Les Verres de l’épave romaine de Tiboulen de Maïre (Marseille, France) : Dotation de bord ou vestiges d’une cargaison complémentaire?